Ok, cooking healthy treats is sometimes a difficult task, but these cookies just come out perfect each time I bake them. Their taste is so heavenly and their smell is so tempting that you will ditch any other conventional cookies. These are the soft kind of cookies but nothing will lead you to believe that these are paleo, refined sugar free, grain free, gluten free and that they contain just the simplest healthiest ingredient ever. The first time I baked these were as a get well soon token for my boyfriend. I wrapped them in a plastic bag and tied them with a ribbon. I thought they were the perfect gift for someone undergoing a recovery since they lack artificial sugars which is so harmful for any type of recovery. They kept smelling nice for a week and everyone was giving compliments for the lovely smelling cookies. This is, by far, one of my favorite recipes and it works great every time. Preheat the oven at 180 degrees Celsius and line a tray with baking paper. If you are using chia seeds instead of eggs, mix them with water in a bowl and let them soak up the liquid, stirring occasionally. These will become a mushy paste. Then use them normally instead of eggs. Start by mixing the dry ingredients (except chocolate drops) in a food processor using 'S' blade to well combine. If you do not have a food processor you can easily mix these by hand. Add in the wet ingredients and blend at slow speed. Scrape the sides of food processor and blend again until ingredients are well incorporated. The mixture should form a dough ball. If the mixture is very dry add some more coconut oil. Remove the food processor blade and pour in the chocolate drops or chopped dark chocolate. Use a table spoon to mix well in the batter. Use an ice cream scoop to scoop out batter and neatly place it onto the baking trays. Then, use the back of a tablespoon to flatten the batter. Alternatively you could scoop out some batter using a tablespoon and use the help of another tablespoon to flatten the dough making a round shape. Bake in the oven for 10-12 minutes. Cooking will vary depending on ovens but these cookies will cook before they turn golden. I like to use a light colored tray as they might burn in darker baking trays.Use a toothpick to check if the inside is cooked. Toothpick will come out clean when inserted in the middle. Enjoy as breakfast with your cup of tea or as a snack. Using ground almonds substitute will yield an almond flavor and I suggest using pure almonds to get the real deal cookie flavor. These cookies do not taste like almonds. You will have plenty of cookies with this recipe. 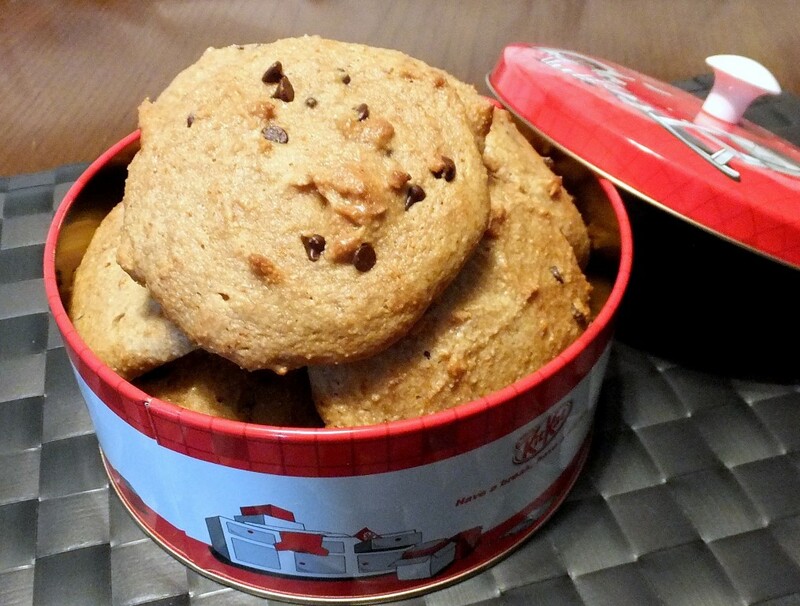 Use half of the ingredients if you want a small batch of cookies to bake at one go.